Golden Rules to Saving Water. It's not hard to start saving water, nor will you have to sacrifice anything in your daily routine either.Water is so abudant here in North America, that we think that it's never going to run out,but if we all think this way,someday watering rules will become more stricter if they already haven't all because we abused it to much.As the old expression goes,nothing last forever,but it doesn't have to be this way. When you think that every American or Canadian consumes on average 60-65 gallons of water each day. Water is essential to life and to humans,there's no doubt about that.We use it to cook, clean and water our lawns and gardens. Compared to the Europeans, we use more than twice as much water.Want more stats? How about 568 billion litres of water that evaporate from swimming pools in the United States. Water use can increase in the summer by 50% due to everybody washing their cars,watering the garden or washing the asphalt.Now why would you waste so much tap water to wash asphalt? This is where rainwater harvesting comes into the picture. Weather your washing your car,washing windows or cleaning your asphalt with pressurized water, all these activities do not require treated drinking water right? Rainwater harvesting is part of the solution to start saving water.The other part is to be aware of our actions in conserving water. So lets all start collecting rainwater.Advice is only good as long as we as people are responsible of our actions. Rainwater harvesting is something that everybody should adopt.It should be like brushing our teeth in the morning,you don't think about it,you just do it. 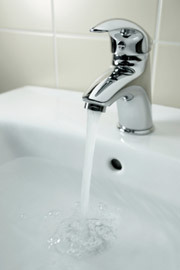 The rest of the tap water can be left for drinking and taking a shower. Saving water is easy if we all follow some simple water saving tips. Take care of that leaky faucet. A leak of one drop per second wastes 10000 litres of water per year, the equivalent of a small rain water tank. This can usually be fixed by replacing a washer and you will be saving 20-30$ on hot water per year. By following some simple water saving tips, we can all still enjoy our gardens and daily outdoor activities in a more responsible way. Suppose you are using rainwater captured from your rainbarrel. 1.) Water hanging plants or potted ones using a watering can. 4.) Don't trim your grass shorter than 2cm or else, you'll have more exposure to the sun and water loss due to evaporation. Longer grass requires less water. 5.) Instead of using a regular lawnmower, get one that mulches the grass. This will help reduce the amount of water needed. 6. )Try to water your lawn in the evening instead of the day. Canada has about 25% of the world's wetlands-the largest wetland area in the world.